Purple class team are; Ian - class teacher, Nikki our lead teaching assistant (TA2) and our TA1 team of Charlotte, Jemma and our new arrival Marie. For the remainder of the summer term our topic is called 'Splish splash splosh', and will involve lots of water play and investigation. We will of course be having lots of fun with water but we will also be investigating how to stay dry in wet weather and will be looking at lots of different uses for water too. Towards the end of term we will be visiting the water play park in Cassiobury Park Watford, we will also be having a water fun afternoon at school. In numeracy we will be investigating 3d shapes and their uses as well as continuing to practise counting set numbers of objects and using number in everyday situations. In cookery sessions we will be making different types of ice cream and investigating changes to liquid when it is frozen and heated. We will be continuing to swim until the end of the academic year. Ian and the purple class team. Our topic for the first half of summer term is 'Down on the farm'. We are very excited about visiting Mead Open Farm and have our fingers crossed that the weather will be fair! In the classroom and around the school we will be learning animal names and the sounds each animal makes, we will also be making representations of each animal using a range of materials. In numeracy sessions we will be doing lots of work counting and grouping animals and also sorting animals. Our literacy sessions will be led by the story 'Who's in the shed?' by Brenda Parkes. Our gardening sessions are focusing on planting and growing and there are plans to make a farm shop over the final week of term when we have some home grown produce to sell. In cookery sessions we will be focusing on making pizzas, starting with making basic doughs and extending into adding and selecting toppings. We will be swimming for the whole of the summer term. This half term our topic is called 'Making sense' and we will be investigating our senses. This will involve lots of tasting, smelling, looking, listening and touching and will also give the children a chance to think about what they like and don't like! During this half term we have chosen an author to focus on (this is an extended version of world book week). Across Key Stage One we will be enjoying the work of Nick Sharratt, you can find out more about him and his books here. Purple class have enjoyed taking part in their topic 'What a performance' this half term. 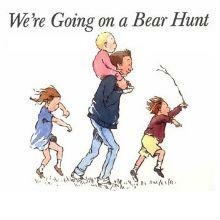 We have been working with the story 'Going on a bear hunt' and everybody has enjoyed learning the story and actions. We even had a final 'performance' of the story at the end of term! Mr Tumble hide and seek game. We have continued our 'life skills' work visiting local shops to find items on shopping lists and we will also be continuing to go on our daily power walks both to encourage exercise and to experience our local environment.